Felix Pedro struck gold on July 22, 1902, in a creek 12 miles north of E. T. Barnette’s Trading Post. 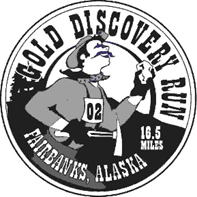 In 1965 the Gold Discovery Run was inaugurated to commemorate his discovery, which led to gold fever and the founding of Fairbanks. Sunday, July 21, 2019 will mark the 54th Annual running of this unique event, which is part of the Usibelli Running Series. Online Race Registration Coming Soon! If you would like to become an RCN member and save money on race fees, see our Membership page. Entries are on-line only. No computer access? Not a problem! On-line registration with courteous assistance will be available at bib pick-up. Race entrants, by registering, give permission to have their photograph or video image used in printed and electronic publications, or video broadcasts, or any similar electronic means. Commemorative 54th Annual T-shirts will be available for the first 200 registrants, and all finishers will get a patch. Bib pick-up will be at the Alaska Salmon Bake in Pioneer Park, on Friday, July 19, from 5:30 pm until 7:30 pm. In 2002, the Gold Discovery Run moved to a new course starting at the Kinross Fort Knox Gold Mine that covers historic mining territory and traverses through trails and gravel roads, leading to a flat, paved sprint to the finish. 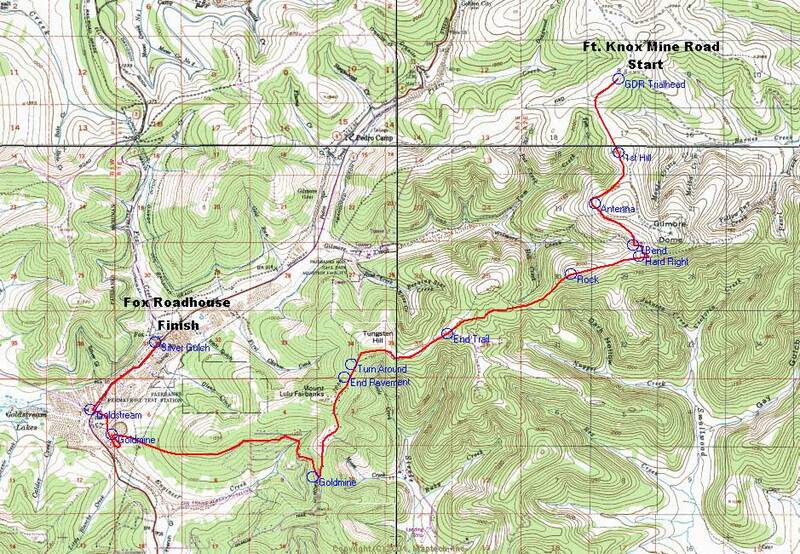 Elevation: 1648 feet of elevation gain, 3198 feet of elevation drop, for a net elevation drop of 1549 feet. Start: Runners should park across the Old Steese from the Silver Gulch Brewery at the Howling Dog parking lot. The race starts atop Cleary Summit at intersection of the old Circle Fairbanks Trail and the Fort Knox mining road. Important: As the start is on an active mining road and there is no parking at the start, for safety and of necessity runners are required to take a shuttle bus from the Silver Gulch Brewery (Fox Roadhouse) to the starting point. Start times are 8:00 am for runners expecting to take more than 3 hours and 9:00 am for runners expecting to take less than 3 hours. Busses will depart 45 minutes prior to race starting times at 7:15 am and 8:15 am, respectively. Do not be late or you will literally miss the bus!! Early wave – 8AM – only for those expecting to take over three hours to finish – you cannot win the race if you start in the early wave. The shuttle bus for the 8AM start leaves Silver Gulch Brewery in Fox at 7:15AM. DON’T MISS THE BUS!!! Standard wave – 9AM – for all runners anticipating taking less than three hours to finish; if you want to win the race you must start in this wave. The shuttle bus for the 9AM start leaves Silver Gulch Brewery in Fox at 8:15AM. DON’T MISS THE BUS!!! The finish line officially closes at 1 PM, but we keep time until the last runner comes through. Finish: Silver Gulch Brewery on the Old Steese Highway in Fox. Note: This is the course description for the race through 2018. In 2019, it will change somewhat in the early miles because of expansion of the Fort Knox mine. We’ll post the changes, and perhaps update the distance and elevation figures, when we know more. The course begins high atop Cleary Summit, and offers stunning views of the Alaska Range in the far distance. The trail heads off to the southeast on the old Fairbanks to Circle Mining Trail, then veers south along the power line after about a third of a mile. The Fort Knox mine pit is visible through the trees off the left side of the trail. About a mile into the trail, you crest a hill, and the trail then curves around the west flank of Gilmore Dome to a communications antenna. At that point the trail widens out and the power line ends. Not far past the antenna, after a downhill coast, you’ll encouter an intersection. The right hand road, which leads down to the NOAA tracking site, is blocked with no trespassing barriers. Continue to the left at the intersection for a short distance southeast, and take a hard right down and to the southwest onto a narrower trail. From this point you will see the trail ahead as it crests over a smaller dome straight ahead. After cresting the dome, a rock outcropping to the right of the trail offers a fantastic panorama of the Alaska Range to the south, and Ester, Murphy, Pedro, Wickersham, and Gilmore Domes. The trail then goes steeply down, and continues in a generally west southwest direction through the woods, winding through numerous undulations and then emerging onto a dirt road and parking area. At this point, the first Water Station, you have come a little over 7 miles. Continue down the dirt road to the right for under two miles to the turnaround at the end of Gilmore Trail. Another couple of hundred feet and pavement begins. 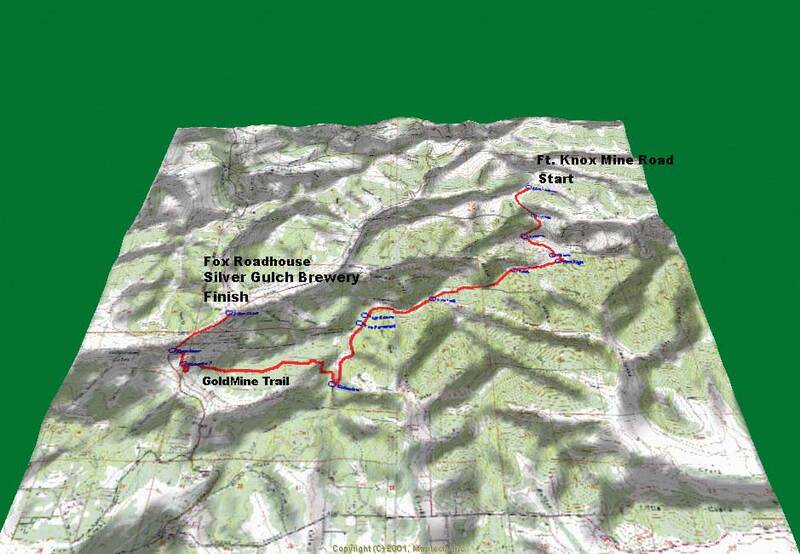 Follow Gilmore Trail about two miles, then make a sharp right onto Goldmine Trail, just past 10 miles into the race. Goldmine Trail is all gravel and chip seal, and starts with a steep descent down to Engineer Creek, followed by about four miles of mostly down to the Steese Highway. From here on it is paved and flat, crossing over (runners must yield to traffic) and heading north on the Steese Highway, and then taking a left at Goldstream Road and continuing west on Goldstream. Take a right onto the Old Steese for the final mile plus sprint into the finish line at the Silver Gulch Brewery.